Emergency personnel transport a father and son to safety after rescuing them from the Connecticut River during Tuesday’s storm. SOUTH HADLEY – A father and son were rescued from the Connecticut River underneath the Veteran’s Bridge after being stranded on rocks during Tuesday’s tornado-like storm. 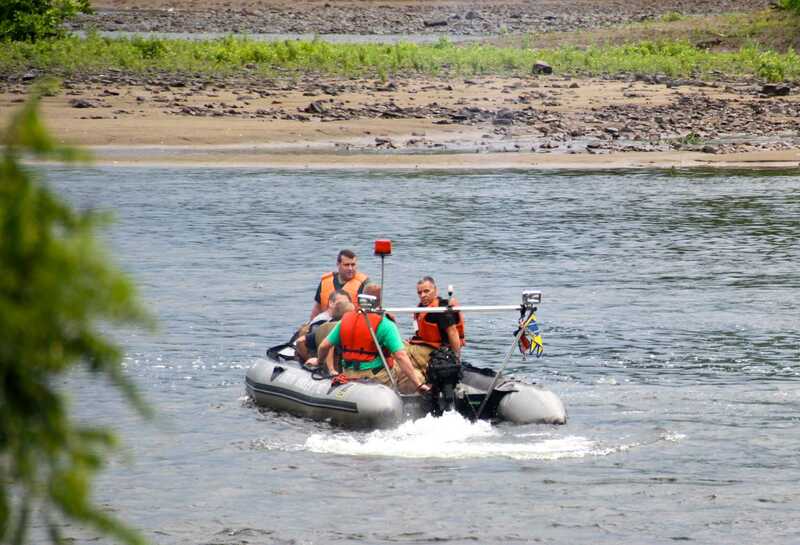 At 4:46 p.m., South Hadley Police first received a report of a capsized boat and parties in the water holding onto pylons just before the South Hadley Falls Dam. South Hadley Fire District 1 responded with assistance from South Hadley Fire District 2, the Holyoke Fire Department and representatives from the Massachusetts Sate Police Fire Marshal’s Office. The two individuals had been fishing on the Connecticut River when they learned about the coming storm, said South Hadley Police Chief David LaBrie. They were able to get themselves ashore on an island in the middle of the river as the storm hit and subsequently attempted to protect and shield themselves from the intense weather by seeking refuge under the boat. Heavy winds blew the boat off of the father and son, who were then left stranded on rocks in the river. Rescue personnel from South Hadley Fire District 1 deployed their boat from the Chicopee Boat Ramp and were successfully able to navigate their way to the individuals. Other rescue personnel were stationed on shore underneath the bridge. “When these winds came, they came very quickly,” said Fire District 1 Chief Robert Authier, who was on scene. The two individuals were transported to safety where they were evaluated.